You can enjoy rustic farmhouse decor both inside and outside your home. However you may not realize that the same furniture can pull double duty and give you that rustic look you crave in both places. 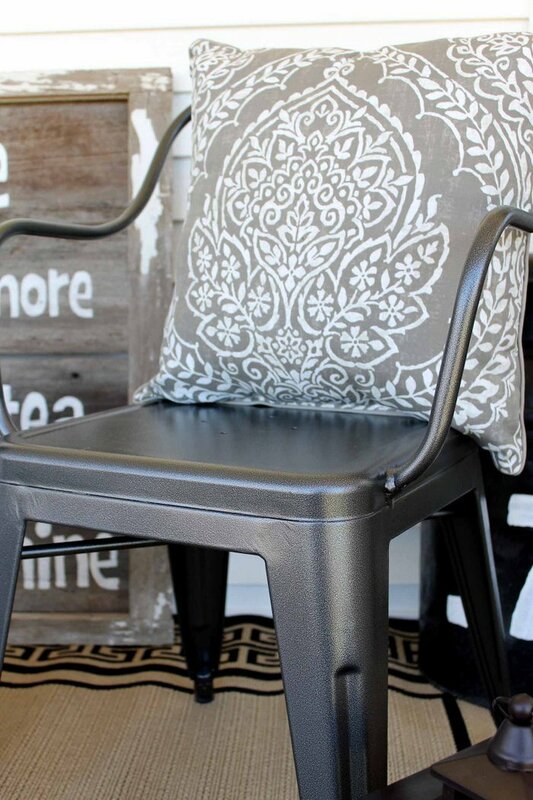 I ran across these gorgeous metal farmhouse chairs and knew that they could work both on my porch and in the foyer. 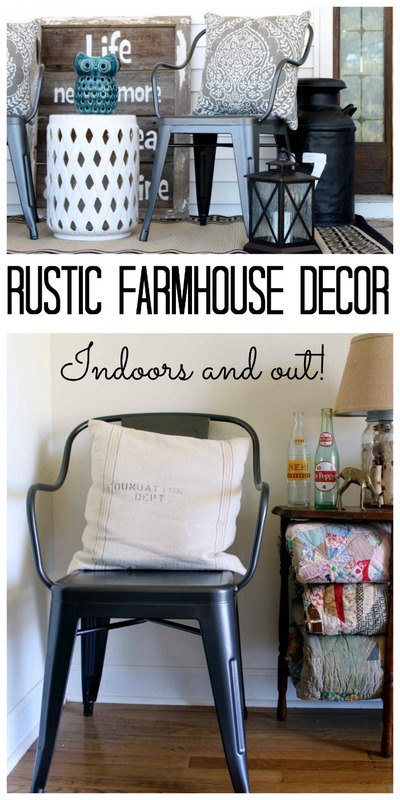 I thought I would share both options with you to inspire your own farmhouse home decor. This post is sponsored by the Better Homes and Gardens Collection at Walmart however all projects and opinions are my own. This all began when I fell in love with these Farmhouse Industrial Chairs . I mean a hard fall. I thought of all of the places I could use these in my home and realized that they are so versatile. They are sold in the patio section and made for outdoors but I can see them in just about every room of my home. I started outdoors however and added them to my porch. I set them on the Greek Key Indoor/Outdoor Rug which is a steal for the price y’all. The quality is amazing and it is perfect if you are looking for a rug outdoors. I added the 3-Tier Plant Stand as well. I have wanted a plant stand for a while to get some of my potted plants up off of the ground and this one was perfect. 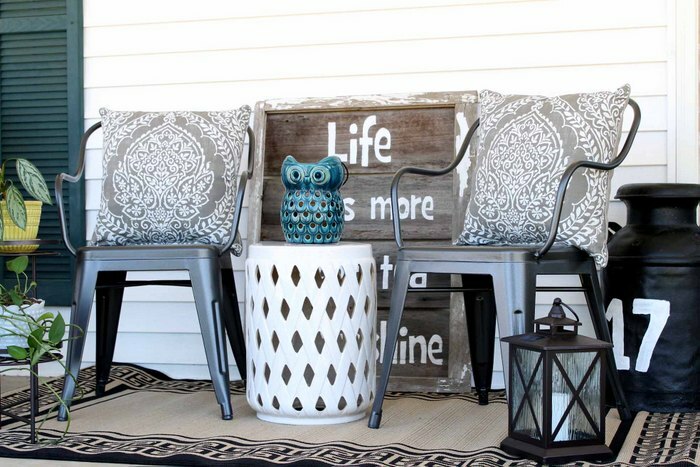 In between the chairs, I added the ceramic table from last year as well as the owl lantern. You can see more about those here. That Metal Lantern is actually solar powered! I love that it looks like a candle but I don’t have to light it at night. 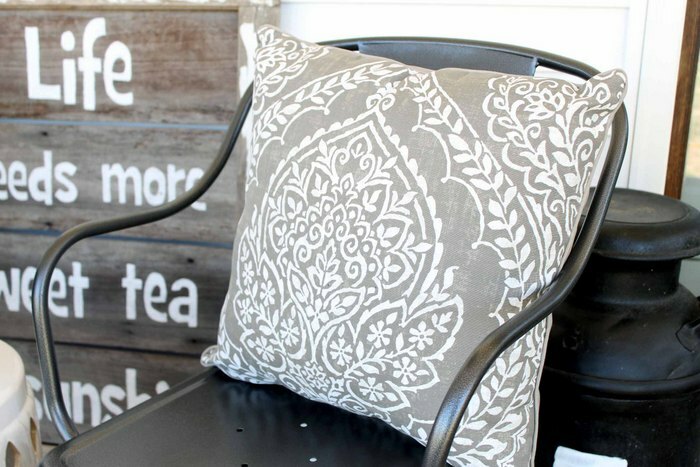 You can also see how to make that rustic wood sign by clicking here. I added a Fleur Outdoor Toss Pillow to each of the chairs. 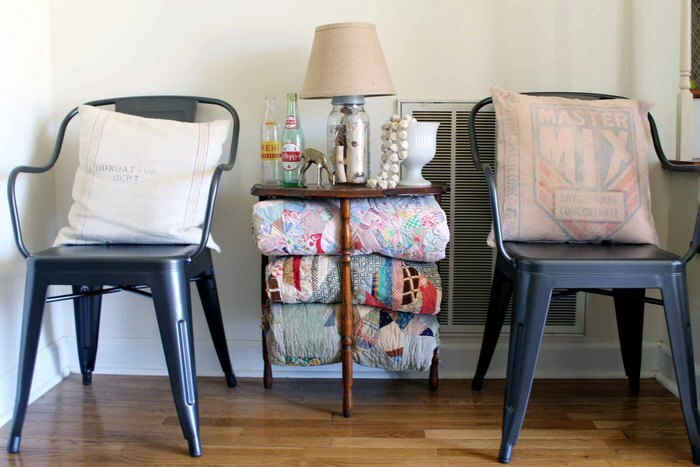 These pillows will also work indoors or out which makes them the perfect addition to these gorgeous chairs. Speaking of the chairs, did you catch that gorgeous metal finish? I am telling y’all they are perfect for your rustic farmhouse decor. Simply gorgeous! I moved them inside just to show you that it can be done. 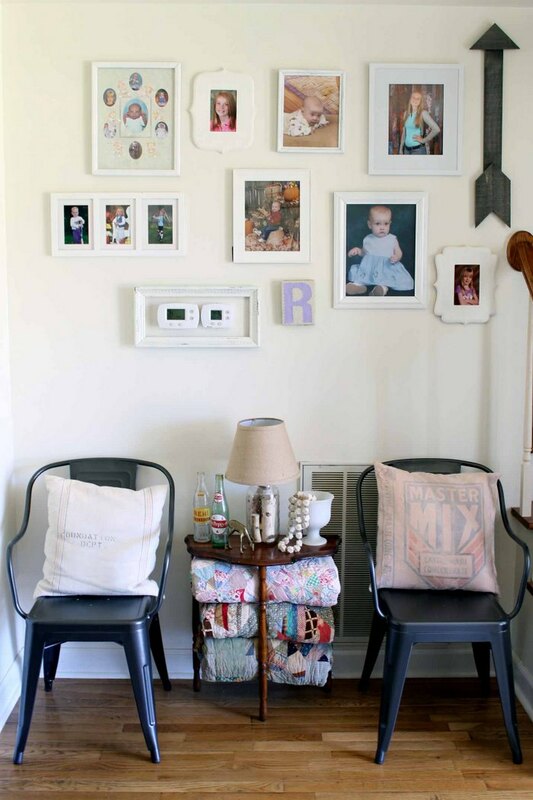 This is an unused area of my foyer that I felt could use some seating. I added two of the Farmhouse Industrial Chairs to the space with a table in between the two. 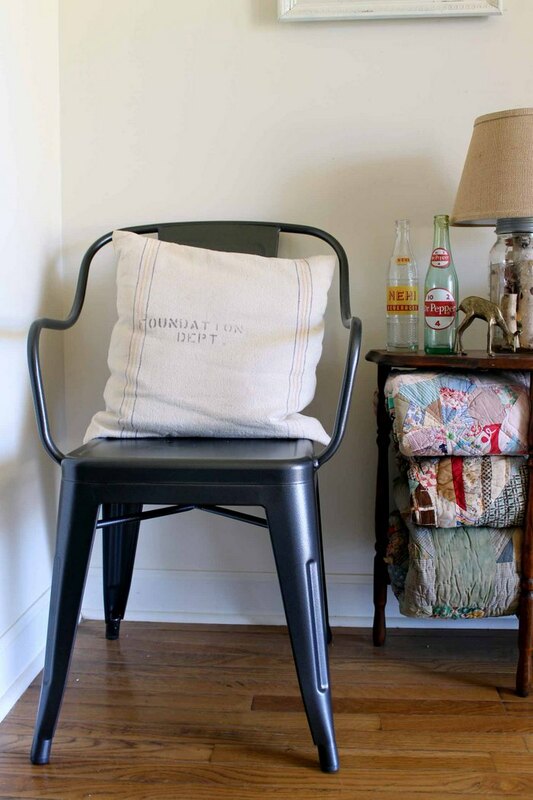 In this case, each chair has a pillow made from a vintage grain sack. The rustic addition really helps to set off the look I am going for. I also added a few stacked quilts to the bottom of the table. You can also see how to make that mason jar lamp by clicking here. I love how these add a rustic farmhouse feel to this area. I was worried about the legs scratching my floors when I ordered these chairs however the chairs come with rubber inserts on each leg! I didn’t even have to add anything to put them in this space. You can see the entire gallery wall below along with my rustic wood arrow. 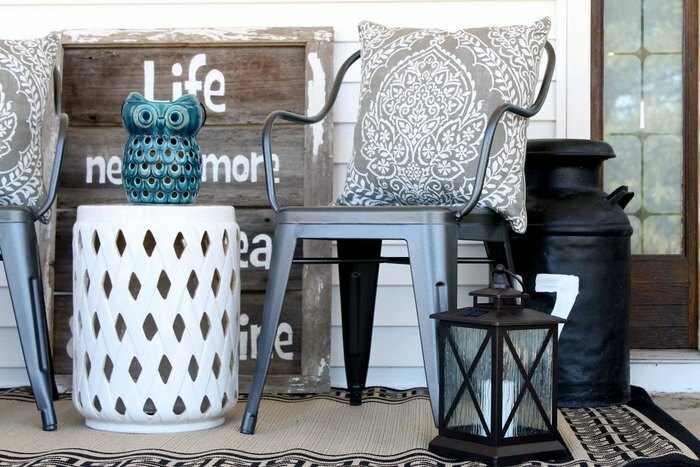 This is just one way to make your home decor stretch from indoors to out. 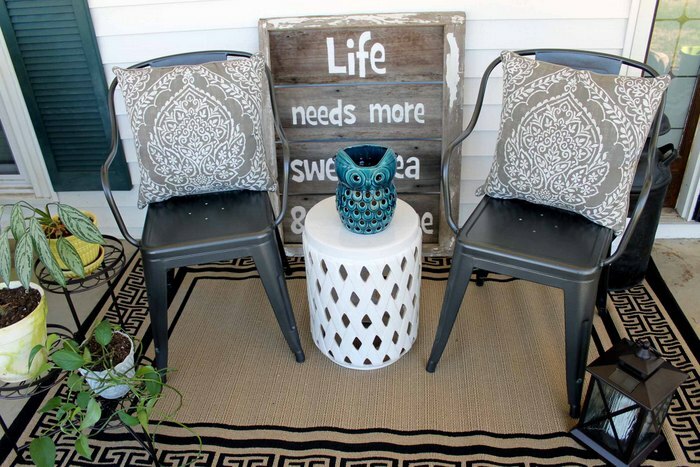 Look for pieces that are rated for outdoor use but would also work great in your home. 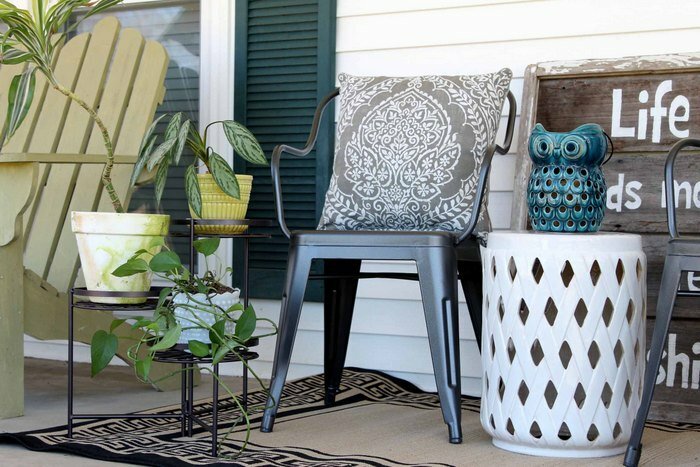 These metal chairs are a great example but the rug and pillows that I used on my porch would definitely have worked as well. Making choices that are versatile opens up a whole new world of options when you get tired of your current arrangement. 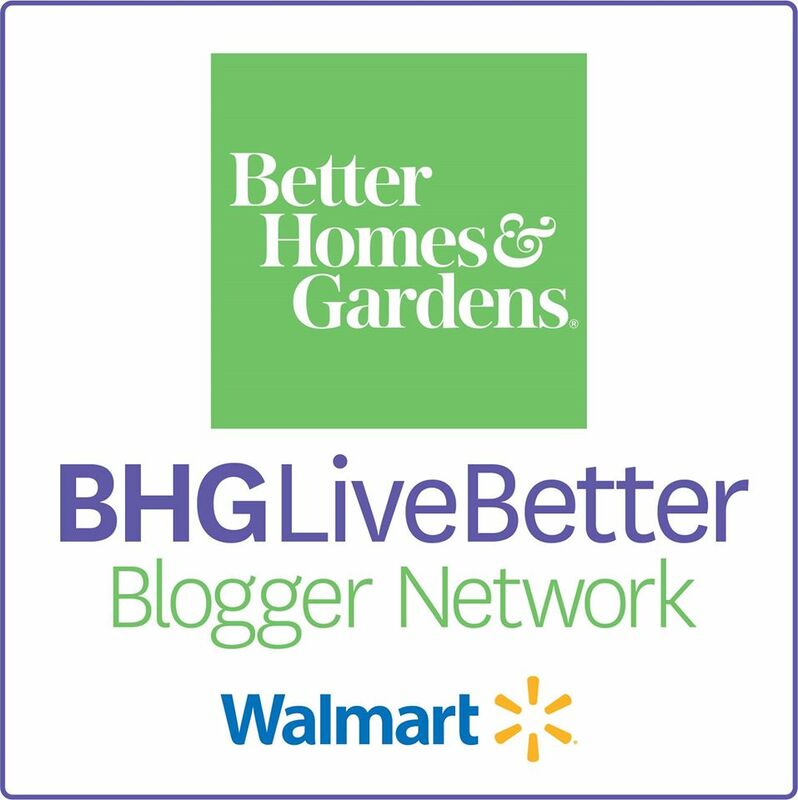 If you are looking to add some rustic farmhouse decor to your home, look no further than these chairs and other items available from the Better Homes and Gardens collection at Walmart. next post: Blackberry Cream Cheese Danish: Perfect for Breakfast! Loving Those chairs!!! Now I need to head back for them. Really cute chairs. I can think of many places that I could use them too. Love these fun ideas that are easy too! Really cute! Love the pillows! Especially the ones on the porch. Love farmhouse decor! I agree with you about the chairs~they are awesome! Thanks so much for sharing at Celebrate It! Thank you for sharing with us at the Merry Monday party! We always look forward to your creativity.